The first time you try Whalebird Kombucha you are going to love it because of our one of a kind flavors and meticulous brewing process that strikes the perfect balance between sweet, tart, and dry. Kegged Kombucha can offer you better margins than bottled. Each keg generates $200 - $275 in sales revenue at 55+% gross profit. More and more people want Kombucha and we’ve got the data to prove it. Kombucha is one is one of the fastest growing beverage categories and according to Spins Analytics grew by 37% in 2017. In grocery we understand that your available floor space is limited. Let our veteran draft techs show you how we can make it fit even if you think you don’t have the space. Tired of the re-order game? Never worry about running out of stock again with automated weekly deliveries of your favorite flavors. Our 100% stainless steel kegs and glass growlers can be reused thousands of times and will save 50,000+ lbs. of plastic in 2018 by not using one way plastic kegs and cups. Let Whalebird bring adventure and beverage innovation to your grocery store with Kombucha on tap! Since 2012 our top priority has been to make a bold yet balanced Kombucha so that you love it at first taste. Each flavor is organic, fermented in small batches, and flavored with dry steeped botanicals, essential oils, and fruit purees for a truly unique and full bodied experience. Not only will our flavors impress your customers but our customer service will impress your staff. 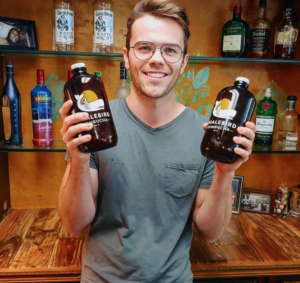 We work with the leading Kombucha distribution company in California that will take care of everything for you including automated deliveries, equipment needs, gas service, draft maintenance, and Kombucha tastings so your customers are well educated and eager to buy. Not only that but if you are in need of additional on tap beverages like nitro coffee, tea, or sparkling water we’ve got you covered. As I am sure you know, Kombucha is one of the fastest growing beverage categories and in 2017 grew by 37% according to SPINS Analytics. The evidence is clear that people want fresh and relevant Kombuchas in the market and one of the ways that we stay current is through our seasonal flavor program. On top of our core flavors we also have a rotating seasonal flavor, that way your customers are always engaged with something new when they come to fill up. Our chief flavor creator searches far and wide to locate emerging flavor profiles that are on the brink of becoming the next big thing. Stick with us and we will ensure that your on tap Kombucha program is nothing less than spectacular. Environmental sustainability is a core tenant of the Whalebird philosophy, which is why we only sell our kombucha in 100% stainless steel kegs which can be re-used thousands of times. Our refillable 32oz glass growlers cut down on plastic waste and will help you sell more volume and create repeat business as a growler refill hotspot! All-in-all our reusable containers are helping save over 50,000 lbs of plastic in 2018 by not using one-way plastic kegs or cups. Beyond the sustainable packaging, when you buy from Whalebird you are also supporting the following California non-profits: Surfrider Foundation, Pacific Wildlife Care, Grid Alternative, Gravity Water, EcoSlo, and the Land Conservancy. Since 2017 we have been hosting regular events that raise money and awareness for local organizations that are motivated to improve the health and wellness of our California and global communities. We will continue to expand our fundraising network so if you have any organizations looking for support please let us know. If you are ready to take the next step or have more questions please fill out the form at the bottom of this page and Chris our California Sales Director will get back to you right away. From all of us at Whalebird Kombucha, we look forward to helping you create a remarkable on tap program to grow your kombucha sales to new heights. "We are always looking for new products to offer our discerning customers, something different and better than what they are used to getting and something they can't just find everywhere. Whalebird offers us on tap, craft kombucha that’s local, and uniquely flavored. Their service has been accommodating in every way, including reliable deliveries, providing equipment and installation, and they do it all with a “Can Do” attitude, eagerness, and urgency. Love working with the Whalebird Team!" How do I get Whalebird Kombucha into my grocery store? Can you provide custom kegerators to fit our space, large or small? Not a problem! Our experienced draft tech team has built custom kegerators across California and can make it work for you. We customize your delivery day and delivery frequency based on your needs. What's the shelf life of a keg? From the time of delivery the shelf life is 4 months as long as it’s kept refrigerated. What’s the shelf life once I pour from our keg into a growler or other sealed container? 1 month as long as its refrigerated and sealed. Once you open it drink it in 2-3 days. What’s the recommended daily intake? To experience the benefits we recommend drinking at least 16oz a day.